1 Comments Published by Cedric Benetti on Saturday, September 22, 2007 at 9/22/2007 12:27:00 PM. 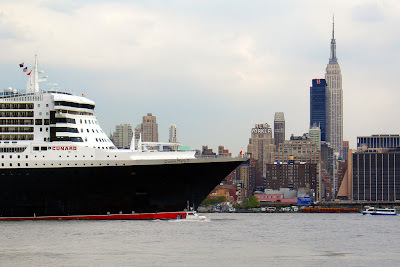 Dear blog, I might have forgotten to tell you this, but, since I seldom use this place to make my personal announcements (cough cough): I will be taking a transatlantic crossing from Southampton to New York aboard the RMS Queen Mary II in June next year! "Just like our ancestors did!" "Yes, mom, I hear you!" Seven days at sea, on board of the biggest transatlantic liner, together with 15 restaurants, bars, night clubs, 5 swimming pools, a musical theater, shopping center, ballroom and planetarium. What, NO private golf course or hippodrome? What about stock car race tracks? A subway system? 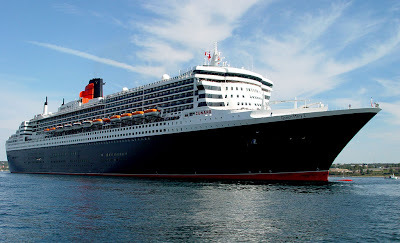 Well at least they have wifi, so I will be able to post daily bulletins on you, dear blog, and report on daily life aboard a royal mail ship (aka lunching, dining, brunching, feasting, eating, snacking, stuffing, drinking... boy I will do my best to keep in shape and not put on weight!). Maybe I*ll take ballroom dance lessons to impress my man, or spend my day walking up and down the 1132 foot long distance from bow to stern (Yes I start using nautical terms so I can have a regular conversation with people on board... I wonder if they have a poop deck!). Oh, and they have a dress code on that thing, so I will need to parade around in a tuxedo at captain*s dinner, and in something called "casual elegant" in public areas... so no Hawaii shirts or thongs and skintight shorts? I will have to buy some ocean outfits. I wonder if they still make those huge hats with the veil that blows in the wind. Definitely a sailors shirt with blue and white stripes, but no silly sailor*s hat! And some large sunglasses while I sip my cosmos on deck. It will be a most delightful experience to play shuffleboard after scones and biscuits at 5 o*clock, and then play a partee of bridge before retiring to the gentleman*s smoking room to read the Times with a good old scotch together with the other chaps of the Reform Club! Jolly good! After arrival I will be spending a week in New York (yippeee) before flying over to the lone star state and visit my dear Erik (major yippeeeee!) and get some genuine Texas culture! I can*t wait for that to happen! It*s a boat! It*s art! It*s CHANEL!